In most claw necklaces still in museum collections, there are an average of 40 claws in a necklace of this type, and usually only the longer front claws were used as the grizzly bear hind claws are much shorter. Large glass trade beads are often used as spacers between the claws, strung halfway down the claw at the secondary perforation alluded to above. In latter years, with the depletion of the Great Plains Grizzly Bear (now extinct), many tribes made claw necklaces from Rocky Mountain Grizzly Bear, or from carved elk antler. 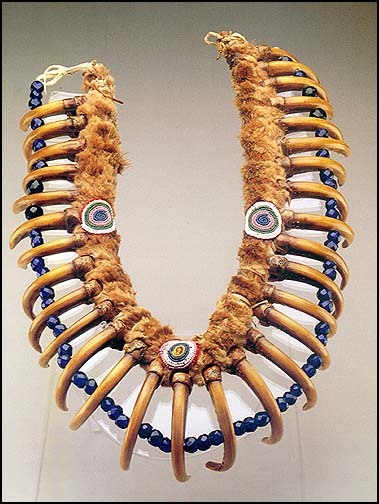 In fact, as an example of how they became so popular, one of these grizzly claw necklaces made from carved elkhorn and collected at Fort Leavenworth, Kansas as early as 1838, is on display at the American Museum of Natural History. 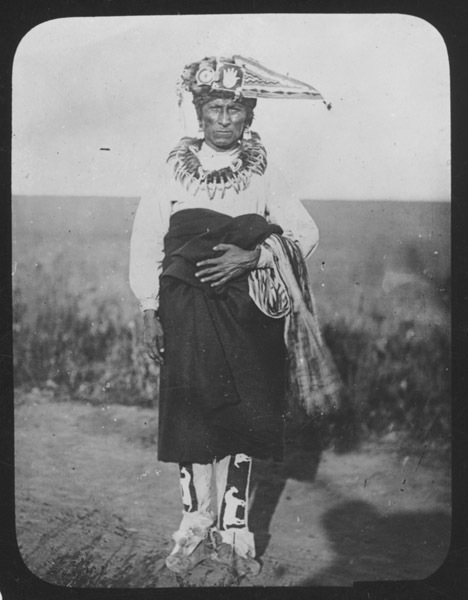 While seen occasionally among straight dancers today, the Grizzly Bear Claw Necklace may not have the same meaning associated with it's use back in the day. Necklace of the Iowa Chief called The White Cloud, displayed by the Iowa tribe of Kansas and Nebraska in their museum. 1986. The Contemporary Oklahoma Pow-wow. Ph.D. dissertation. Department of Anthropology, University of Oklahoma. 1989. The Quapaws. Chelsea House Publishers, New York, NY. Bailey, Garrick, and Daniel Swan. 2004. Art of the Osage. St. Louis Art Museum, University of Washington Press, Seattle, WA. 1898. 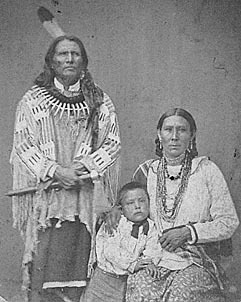 Ponca Indians. Proceedings and Collections of the Nebraska State Historical Society, 2nd Series, Vol. 2, NE. 1993. Native American Beadwork. R. Schneider Publishers, Stevens Point, WI. Cash, Joseph H. and Gerald W. Wolff. 1975. The Ponca People. Indian Tribal Series, Phoenix, AZ. 1918. Notes on the Early Indian Occupancy of the Great Plains. Kansas State Historical Society Collections, 1915-1918, Vol. 14. 1961. Five Indian Tribes of the Upper Missouri. University of Oklahoma Press, Norman, OK.
1904-a. Traditions of the Skidi Pawnee. Memoirs, American Folk-lore Society, Vol. 8. 1904-b. Traditions of the Osage. Field Museum of Natural History, Chicago, IL. 1883. The Religion of the Omahas and Ponkas. American Antiquarian and Oriental Journal, Vol. 5, January-October, James & Morse Publishers, Chicago, IL. 1884-a. Omaha Sociology. Bureau of American Ethnology, 3rd Annual Report 1881-82, Smithsonian Institution, Washington, D.C.
1884-b. An Account of the War Customs of the Osages, Given by Red Corn (Hapa-se), of the Tsi-u Peace-making Gens. American Naturalist, Vol. 18. 1894. A Study of Siouian Cults. Bureau of American Ethnology, 11th Annual Report 1889-90, Smithsonian Institution, Washington, D.C.
1897. Siouian Sociology. Bureau of American Ethnology, 15th Annual Report 1893-94, Smithsonian Institution, Washington, D.C.
Dorsey, Rev. James Owen and Cyrus Thomas. 1907. Iowa. 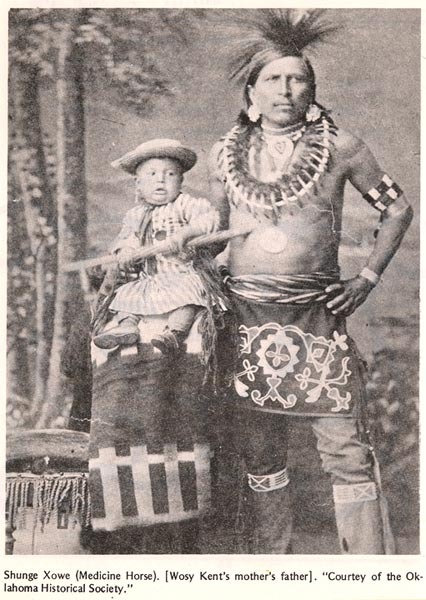 Handbook of American Indians North of Mexico, Bureau of American Ethnology, Bulletin 30, Part 2, Smithsonian Institution, U.S. Government Printing Office, Washington, D.C.
1910. Ponca. Handbook of American Indians North of Mexico, Bureau of American Ethnology, Bulletin 30, Part 2, Smithsonian Institution, U.S. Government Printing Office, Washington, D.C.
1997. Hethushka Zani: An Ethnohistory of the War Dance Complex. MA thesis. Department of Anthropology, Northeastern State University, Tahlequah, OK.
2003. A Dancing People: Powwow Culture on the Southern Plains. University of Kansas Press, Lawrence, KS. 1957-a. Costume of the Oklahoma Straight Dancer. The American Indian Hobbyist Newsletter, Vol. 4, No. 1. 1957-b. Costume of the Oklahoma Straight Dancer. The American Indian Hobbyist Newsletter, Vol. 4, No. 2. Feder, Norman and Milford G. Chandler. 1961. Grizzly Claw Necklaces. American Indian Tradition Newsletter, Vol. 8, No. 1. 1992. Native American Dance: Ceremonies and Social Traditions. Smithsonian Institution Press, Washington, D.C.
1955. The Pan-Indian Culture in Oklahoma. The Scientific Monthly, Vol. 81, No. 5. 1976. Ceremonial Dress of the Delaware Man. Special Issue, The Bulletin of the Archeological Society of New Jersey, No. 33, Seton Hall University, South Orange, NJ. 1983. Pan-Indianism in Native American Music and Dance. Ethnomusicology, Vol. 28, No. 1. Howard, Dr. James H. and Gertrude P. Kurath. 1959. Ponca Dances, Ceremonies and Music. Ethnomusicology, Vol. 7. 1951. The Pawnee Indians. University of Denver Press, Denver, CO.
1974. Ethnohistory of the Ponca. Garland Publishing Inc., New York. 1998. Spirit Capture: Photographs from the National Museum of the American Indian. Smithsonian Books, Washington, D.C.
1992. Southern Plains Dance Tradition and Dynamics: Native American Dance Ceremonies and Social Traditions. National Museum of the American Indian, Smithsonian Institution with Starwood, Washington D.C.
1998. Straight Dance Clothing: How to Dress a Straight Dancer. Whispering Wind: American Indian Past & Present Magazine, Vol. 29, No. 4, Folsom, LA. 1914-a. Osage Songs and Rituals. Smithsonian Miscellaneous Collections and Explorations, Vol. 65, No. 6, Smithsonian Institution, Washington, D.C.
1914-b. Ceremonies and Rituals of the Osage. Smithsonian Miscellaneous Collections, Volume 63, Smithsonian Institution, Washington, D.C.
1918-a. The Osage Tribe: Rite of the Chiefs, Sayings of the Ancient Men. Bureau of American Ethnology, 39th Annual Report 1917-18, Smithsonian Institution, Washington, D.C.
1918-b. Tribal rites of Osage Indians. Smithsonian Miscellaneous Collections, Vol. 68, Smithsonian Institution, Washington, D.C.
1924. Ethnology of the Osage Indians. Smithsonian Miscellaneous Collections, Vol. 76, Smithsonian Institution, Washington, D.C.
1939. War Ceremony and Peace Ceremony of the Osage Indians. Bureau of American Ethnology, Bulletin 101, Smithsonian Institution, Washington, D.C.
1932. Wa’-Kon-Tah, The Osage and the White Man’s Road. University of Oklahoma Press, Norman, OK.
1961. The Osages: Children of the Middle Waters. University of Oklahoma Press, Norman, OK.
1916. Plains Indian Age Societies: Historical and Comparative Study. Anthropological Papers, American Museum of Natural History, Vol. 11, Part 13, New York, NY. Lowie, Robert H., Ed. Clark Wissler. 1916. Societies of the Plains Indians. Anthropological Papers, American Museum of Natural History, Vol. 9, New York, NY. 1972. The Mystic Warriors of the Plains. Garden City, New York: Doubleday. 1985. Plains Indians: Dog Soldiers, Bear Men and Buffalo Women. Bonanza Books, New York. 1999. Kiowa, Apache and Comanche Military Societies. University of Texas Press, Austin, TX. 1914. Pawnee Indian Societies. Anthropological Papers, American Museum of Natural History, Vol. 11, No. 7, New York, NY. 1929. Bead and Beadwork of the American Indians. Contributions from the Museum of the American Indian, Vol. 11, Heye Foundation, New York, NY. 1911. The Osage War Dance. The Museum Journal, Vol. 2, No. 3. 1915-a. 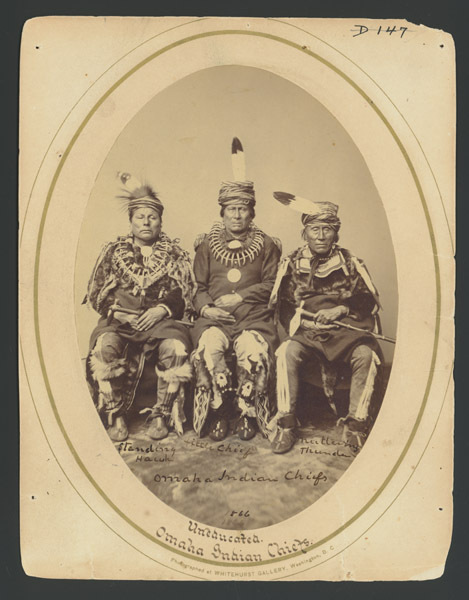 Societies of the Iowa, Kansa and Ponca Indians. Anthropological Papers, American Museum of Natural History, Vol. 11, Part 9, New York, NY. 1915-b. Kansa Organizations. Anthropological Papers, American Museum of Natural History, Vol. 11, New York, NY. 1915-c. Ponca Societies and Dances. Anthropological Papers, American Museum of Natural History, Vol. 11, New York, NY. 1982. Straight Dance Clothes: Getting Them On. Moccasin Tracks Magazine, April Issue, LaPalma, CA. 1968. Dressing a Straight Dancer. The Singing Wire Newsletter, February Issue. 1910. Osage. Handbook of American Indians North of Mexico, Bureau of American Ethnology, Bulletin 30, Part 2, Smithsonian Institution, U.S. Government Printing Office, Washington, D.C.
1910. Quapaw. Handbook of American Indians North of Mexico, Bureau of American Ethnology, Bulletin 30, Part 2, Smithsonian Institution, Washington, D.C.
1928. The Indian Tribes of the Upper Missouri. Bureau of American Ethnology, 46th Annual Report 1924-25, Smithsonian Institution, Washington, D.C.
1887. The Ponca Chiefs. J.S. Lockwood, Boston, MA. 1940. Tixier’s Travels on the Osage Prairies. Translated from the French by Albert J. Salvan, and edited by John Francis McDermott. University of Oklahoma Press, Norman, OK.
1971. The Kansa Indians: The History of the Wind People. University of Oklahoma Press, Norman, OK.
1906. Diffusion of Culture in the Plains of North America. Proceedings of the International Congress of Americanists, Vol. 15, Quebec, Canada. 1915. Costumes of the Plains Indians. Anthropological Papers, American Museum of Natural History, Vol. 17, No.2, New York. Noticed lots of them are those "turban wearing fools". Traditions.....keep them and keep them sacred! I am NOT Indian. I have never been to India, nor has any of my family before me! I have met these people from India, of whom you speak, and I am nothing like them. Why do you call me an Indian? Now I understand the carved antler claws were due to the depleted bear population, and that the right to make/wear a bearclaw necklace came from killing 2 or more bears. Who has the right to make/wear a necklace made from the carved antler? Also how popular were/are the carved necklaces? is this a beaded turban in the photo of "Little Pipe - Otoe - 1869"
Last edited by rezcar3; 10-09-2009 at 10:47 AM.. YES...that is fully beaded "turban" for lack of better words. I have an extended family member that has one that is exactly like Little Pipes but he won't wear it any more because people call him "princess". It is sad that our own people don't know their own traditional clothing styles. I was hoping Historian would have answered the question about who could wear the carved antler necklaces. I've seen just a few pictures of carved antler necklaces in my many years of looking at old photos. Last edited by Mato Mahe; 10-09-2009 at 01:20 PM..
thanks for the info. it looks good. i think i saw a northern traditional dancer with something similar at gathering of nations a couple of years ago. ill look for the photo. ... Phishing for answers, cause you're thinking of getting one? *L ... Phishing for answers, cause you're thinking of getting one? Or Maybe I Just Like Learning New Things, Or Having A Discussion On A Topic Thats Not Who Should Have Won Or Bashing Another Hob. As far as I know, today, the right to wear a set of grizzly claws, or even a set of imatation claws made from elk antler, is determined by families, clans or societies within each tribe who still hold that tradition. For the most part, men who wear a set of claws are usually veterans, or someone who has been given the right to wear them by a veteran. I have only seen pictures of men wearing bear claws. Were women ever allowed or given the right to wear bear claws? I've never seen or heard of women wearing a set of Grizzly Bear claws. thank you for your input Historian I was curious about that. Those claws seem good, they have good shape. Be brave, lose your mind and make me the chief, and then we'll face the world together and will win.